Performing on period instruments, the Dresden Festival Orchestra under the experienced direction of Ivor Bolton was founded in 2012 for performances at the Dresden Music Festival. Specialising in historically informed performance practice, the orchestra was formed in the spirit of the renowned Orchestra di Dresda, the former court orchestra of August the Strong (1694-1733). I’ve been fortunate to have attended four concerts by the orchestra at the Dresden Festival and it certainly excels programming music from Wilhelm Friedemann Bach to Richard Strauss, Antonio Vivaldi to Mascagni; exploring wider eras than one might imagine. German-born Jan Vogler, now based in New York City, a renowned cellist, is also the intendant of the Dresden Music Festival since 2008. I have attended the festival for several years and under Vogler’s management it has developed international prominence, attracting the world’s finest artists, each year continuing to grow. 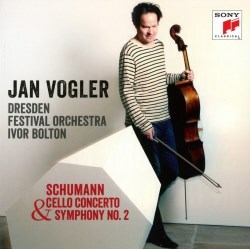 Vogler usually plays on modern strings and the Schumann Cello Concerto is a core work in his repertoire, having recorded it in 2000 with the Münchener Kammerorchester on the Berlin Classics label. The score could almost be described as his calling card; the work international concert promoters request him, as a German soloist, to play. This recording of the Schumann Concerto came about, when Ivor Bolton asked Vogler, if he would perform the score on gut stings with Dresden Festival Orchestra at the closing concert of the 2016 festival at the Semperoper. The cellist was up to the challenge and when I interviewed Vogler for ‘Seen and Heard International’ in May this year, the Dresden Festival was in full swing and he was rehearsing the concerto, having fitted gut strings to his Stradivarius ‘Ex Castelbarco/Fau’ (1707). Just over a week prior to the closing Semperoper concert Vogler and the same forces produced this recording at the Lukaskirche, Dresden; a renowned recording venue. After leaving Dresden to take up his appointment as music director of Düsseldorf, Schumann wrote his Cello Concerto in October 1850 in just two weeks. At this time Schumann was describing the score as Concert Piece for cello with orchestral accompaniment, emphasising the secondary role of the orchestra. It seems that Schumann rejected advice from local cellist Emile Bockmühl for more flamboyancy for the soloist. A planned première in 1852 didn’t take place, but the score was eventually published in 1854. By the time the work finally received its première in 1860 Schumann had been dead four years. The three movements are connected together, playing continuously and there is accompaniment to the cadenza. It soon becomes evident in the opening movement Nicht zu schnell that Vogler has full measure of the score he knows so well, and is relishing the new sounds from his gut strings. Vogler takes the listener into an agreeable, warm and intensely lyrical sound world, a comforting, idyllic world that the composer so rarely achieved in his own life, owing to the turmoil caused by his well documented mental health condition. Vogler excels, playing assuredly in the passages requiring brilliant virtuosic display. In the central movement of generous Romanticism marked Langsam, Vogler is entirely captivating, expressing the characteristic songlike lyricism imbued in the score. At times the writing feels like a love letter to Clara but palpable is the undertow of melancholy Vogler creates. Seamlessly done is the accelerando passage, leading into the closing movement Sehr lebhaft. Uplifting, full of glorious runs, one might question, if the cello in this work ever has sounded as mellow as Vogler’s gut strung Stradivarius. Especially enjoyable is the buoyant and delightful flourish to the conclusion. Under Bolton’s direction, the support from the Dresden players does full justice to Schumann’s orchestral writing. Of the recordings of the Schumann Cello Concerto, from its release in 1992, my benchmark has been Heinrich Schiff for his aristocratic playing with the Berliner Philharmoniker under Bernard Haitink from 1988 at the Jesus-Christus-Kirche Dahlem, Berlin on Philips. With this stunning new release from Vogler, Schiff now has a firm competitor. Ivor Bolton and the Dresden Festival Orchestra also played Schumann’s Symphony No. 2 at the Semperoper concert that closed the 2016 festival and recorded the work at the Lukaskirche sessions. Written in 1845/46 during his time living in Dresden, the Symphony No. 2 is, according to Sir Simon Rattle, probably the most symphonic sounding of the four Schumann symphonies. A work that comes from an anxiety- fuelled and desperately depressive period in the composer’s life, Schumann said “Only in the last movement that I start to feel myself again; but it was only after I’d finished the whole work that I really felt any better. Otherwise it reminds me of a dark period in my life.” It was Felix Mendelssohn, who gave the first performance of the score in 1846 at the Gewandhaus Leipzig. In the opening movement the Dresden Festival Orchestra provides a crucial sense of engagement and the “music of light and shade, sunshine and shadow”, which Schumann described. Buoyantly rhythmic the Scherzo, eminently Mendelssohnian in elfin-like spirit, is given sprightly, yet focused playing with the development towards the climax of the movement sounding especially impressive. Bolton in the lyrical Adagio expressivo communicates a heartfelt interpretation, infused with melancholy, providing a natural and unforced ebb and flow to the music. Dramatically engaging in the closing movement, the Dresden orchestra plays with freshness and a sense of youthful exuberance. It feels like the players are acknowledging the composer’s recently improved optimistic state of mind, which he experienced whilst working on the Finale. Not surprisingly the Schumann symphonies have proved enduringly popular with conductors in the recording studio. A few conductors such as Riccardo Chailly and the Gewandhausorchester Leipzig have used Mahler’s revisions. Over the years the Berliner Philharmoniker has made a number of recommendable recordings of the complete Schumann symphonies using modern instruments, with the finest of them from Sir Simon Rattle (review), using a standard complement of forty strings on his live 2013 set on Berliner Philharmoniker Recordings, compared to Bolton’s thirty-five. For those wanting the complete set of symphonies, Rattle’s interpretations feel fresh and invigorating with performances that breathe new life into the works. Ivor Bolton with the Dresden Festival Orchestra make a strong case for period instruments performances and becomes my first choice in the Symphony No. 2. For the recording Sony has chosen the wonderful acoustic of Lukaskirche, Dresden with the engineering team providing warm, reasonably clear and well balanced sound with Vogler’s cello being especially well set with the orchestra. The accompanying booklet contains a note from Vogler and a concise essay by Bernard Hentrich. My minor grumble is that the available space on the recording hasn’t been used to accommodate another Schumann work such as the Genoveva or Manfred overtures. For its feeling of spontaneity and searing intensity of lyrical feeling in the concerto and the strong sense of engagement in the symphony, this wonderful recording on period instruments has hardly been off my CD player since it arrived. Excuse the cliché but I can’t recommend this Sony release highly enough.